Food Network Photo The Chairman, center, reveals the secret ingredient -- ground beef -- to Iron Chef Bobby Flay and Utah chef Viet Pham on Sunday night's episode of "Iron Chef America." Salt Lake City restaurant owner Viet Pham took down an Iron Chef on Sunday with a Utah secret weapon  ice cream. Make that beef fat ice cream. 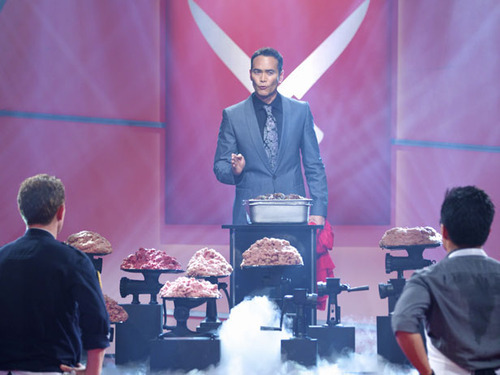 On Sunday night&apos;s episode of "Iron Chef America" Pham, co-owner of Salt Lake City&apos;s Forage restaurant, defeated Iron Chef  and Food Network darling – Bobby Flay in what was dubbed: Battle Ground Meat. The two chefs had one hour to create five dishes using a combination of ground beef, pork, veal, turkey and lamb. The early decision by team Pham  which included his Forage co-owner Bowman Brown and chef Luke Fowles  to make ice cream from ground beef drippings sent host Alton Brown into a frenzy. "You&apos;re watching history, folks," he told viewers, of the ice cream that was eventually served with cherries cooked two ways and topped with beef fat powder and a cocoa and ground beef crumble. Food writer and judge Simon Majumdar said the dessert sounded "ridiculous." But after tasting it, he gave it high praise: "It works. I&apos;ve never heard of it. Never even considered it, yet I could eat every bit of it. It&apos;s delicious. Incredible." While the beef fat ice cream got the most buzz, it was Pham&apos;s "First Dish" that got him the win. The First Dish is a new part of the Iron Chef competition in which each chef must serve a dish to judges in the first 20 minutes of the battle. Pham offered up a soft scrambled egg served in an egg shell  and topped with maple syrup, sausage and cream. He received a score of 14 out of 15. Judge Ben Sargent called the creamy breakfast bite "amazing." On the flip side, Flay&apos;s sausage crepinette was deemed too salty and it received only 8 points. Not every Pham dish was a success. Judged didn&apos;t like the beets with beef borscht. They said the ground beef was chewy and the dish lacked flavor. This particular "Iron Chef" episode was filmed in July. In the audience were Pham&apos;s Vietnamese-born parents, who immigrated to the United States when the chef and his brother were still young. Their presence made the win more meaningful, said Pham, who invited more than 100 friends and Utah food industry professionals to Naked Fish restaurant in downtown Salt Lake City last night to watch the episode and celebrate his win. "To be able to beat an Iron Chef is surreal," said Pham, who was the runner-up on last year&apos;s edition of "Extreme Chef." "It was a dream."